It appears history is repeating itself in the best of ways for Hiro Hamada and his friends as Disney Channel has decided to greenlight a third season of the superhero sequel series Big Hero 6: The Series a few weeks ahead of its second season premiere, according to The Hollywood Reporter. The first season, which debuted in June 2018, proved to be a decent ratings magnet for the cable network, averaging about .67 million viewers every week and earning nominations at both the Primetime and Daytime Creative Emmy ceremonies. Disney Channel issued a second season renewal for the series nearly a year prior to the first season’s debut, and it has now ordered a third season nearly three weeks ahead of its second season’s debut. Big Hero 6: The Series, based on the Walt Disney Animation Studios’ Academy Award-winning feature film, continues the adventures and friendship of 14-year-old tech genius Hiro, his compassionate, cutting-edge robot Baymax, and their friends Wasabi, Honey Lemon, Go Go, and Fred as they form the legendary superhero team Big Hero 6 and embark on high-tech adventures as they protect their city from an array of scientifically enhanced villains. In his normal day-to-day life, Hiro faces daunting academic challenges and social trials as the new prodigy at San Fransokyo Institute of Technology. 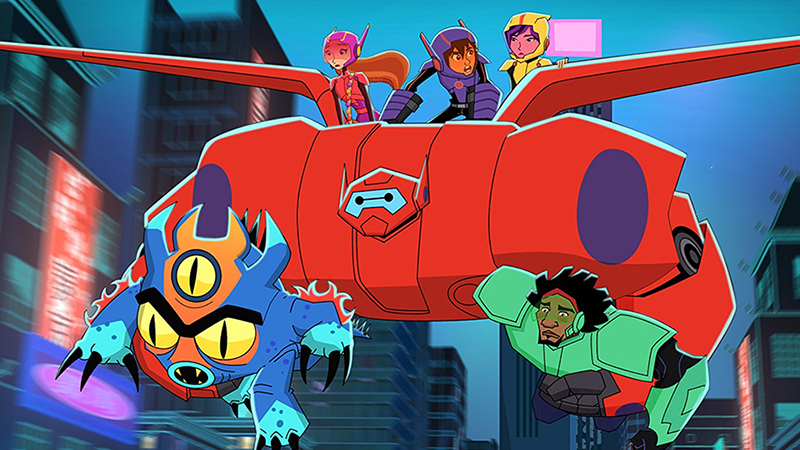 The Big Hero 6: The Series voice cast includes Maya Rudolph as Aunt Cass; Ryan Potter as Hiro; Scott Adsit as Baymax; Jamie Chung as Go Go; Alan Tudyk as Alistair Krei; Khary Payton as Wasabi; Genesis Rodriguez as Honey Lemon; Brooks Wheelan as Fred; David Shaughnessy as Heathcliff; and Marvel Comics legend Stan Lee as Fred’s dad. Recurring guest voice vast includes Jenifer Lewis as Professor Granville; Haley Tju as Karmi; Andrew Scott as Obake; and Andy Richter as Globby. Emmy Award-nominated Christy Carlson Romano reunites with the creative team of the global hit Disney Channel series Kim Possible — Emmy Award-winning producers Mark McCorkle, Bob Schooley, and Nick Filippi — when she guest stars as bot-fighter Trina. Additional guest voice cast includes celebrity chefs Gordon Ramsay and Alton Brown as cooking competition participant Bolton Gramercy and host Yum Laboughè, while Daniel Henney (Criminal Minds) and James Cromwell (The Young Pope) reprise their feature film roles as Hiro’s brother Tadashi and Professor Callaghan. Susan Sullivan (Castle) voices Fred’s mother, with John Michael Higgins (Pitch Perfect) playing Fred’s sidekick robot Mini-Max. Diedrich Bader (American Housewife) voices pompous local TV reporter Bluff Dunder; Sean Giambrone (The Goldbergs) is Fred’s geeky archival Richardson Mole; Naoko Mori (Mamma Mia! Here We Go Again) is thief-for-hire Momakase; Lucas Neff (Raising Hope) plays fast food mascot Noodle Burger Boy; and Mara Wilson (Matilda) voices Liv Amara, the self-made billionaire. In addition to McCorkle and Schooley, Emmy Award-winning Nick Filippi serves as executive producer and supervising director. The series is a production of Disney Television Animation and carries a TVY7-FV parental guideline. The second season of Big Hero 6: The Series is set to debut on Disney Channel on May 6.